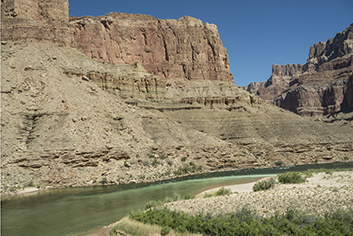 The confluence of the Colorado and Little Colorado rivers, where the turquoise tributary mixes with the emerald mainstem, is sacred to the Navajo, Hopi, Zuni, and other native people of the Grand Canyon region. 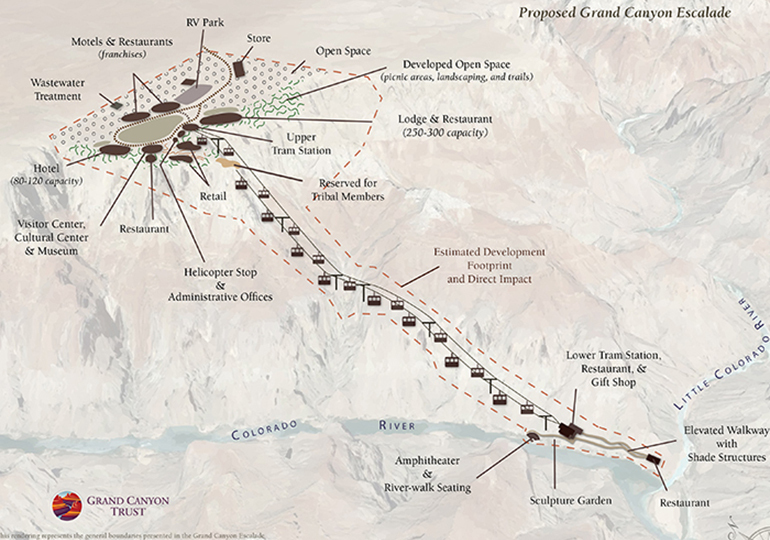 For nearly a decade, outside developers have been pushing the Navajo Nation to approve a mega resort and tramway that would carry 10,000 people a day to the bottom of the Grand Canyon, dumping them at this important cultural site. What would Escalade look like? The Escalade bill is dead, for now. But there's nothing stopping the developers from tweaking the proposed agreement and lobbying the Navajo Nation Council to take up a new bill. Local residents are working at the chapter level to prevent the return of Escalade. 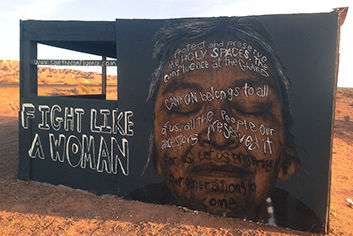 In February 2018, and by a vote of 55-0, the Bodaway/Gap chapter of the Navajo Nation rescinded a contested 2012 resolution that gave local approval of the project. 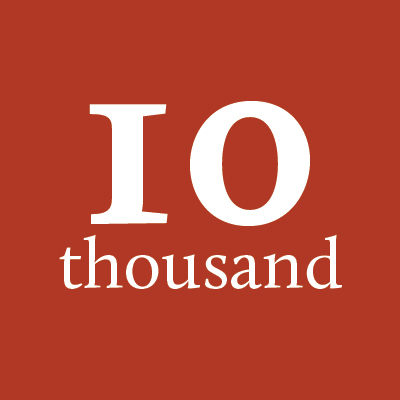 They passed a new resolution in its place stating that the traditional people who graze sheep and live in the proposed development footprint are opposed to the project and have never given their consent for use of the land. In addition, the resolution directs the chapter to designate the confluence as a sacred site. 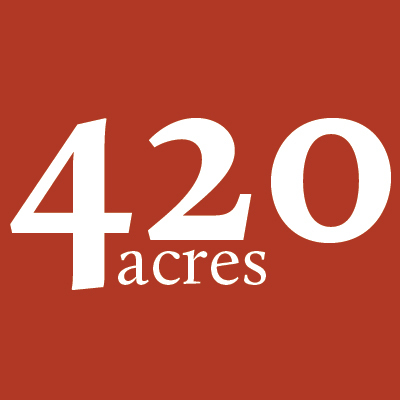 The chapter’s community land use planning committee is working on negotiating this new land designation and looking to get it adopted by the Navajo Nation Council. 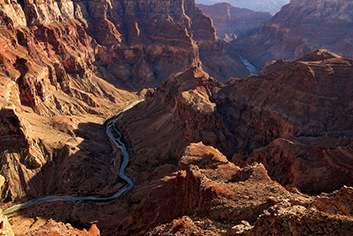 Phoenix developers come up with the idea to build a gondola into the heart of the Grand Canyon. 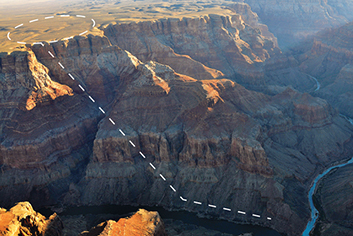 Sometime in 2009, Scottsdale developer R. Lamar Whitmer began scheming to build the Grand Canyon Escalade, a mega resort and tramway that would shuttle up to 10,000 tourists a day to the bottom of the Grand Canyon. Then unknown to the public, his proposed development would be located on 420 acres of Navajo land (about 60 miles by car from Cameron, Arizona), at the confluence of the Colorado and Little Colorado rivers. Over the course of the next few years, the developers worked behind closed doors to sketch up preliminary renderings of Escalade, find financial backers, and lobby the Navajo Nation to approve the project. 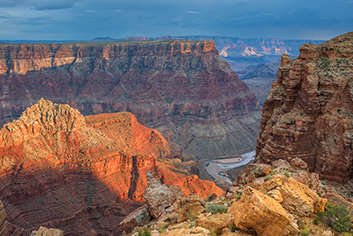 In addition to the tramway, the original Escalade plans included a slew of franchises, hotels, and curio shops on the rim itself, along with an elevated riverside walkway, amphitheater, and sculpture garden below the rim. 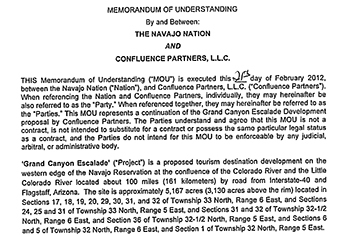 The Navajo Nation signs a Memorandum of Understanding with the Confluence Partners, L.L.C. Parts of the proposed Escalade development were eventually shaped into a Memorandum of Understanding, signed by Navajo Nation President Ben Shelly and development partner Albert Hale. The paper document was not a contract per se, but an informal agreement to work together to move the project forward. Negotiations continued among invited insiders. The local families formally invite several groups, including the Trust, to join in opposition of the development. 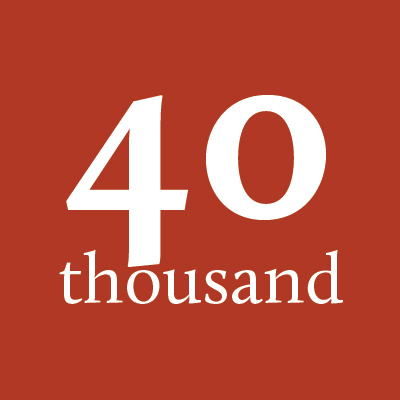 People of the Confluence (now Save the Confluence) put out the call to nonprofit organizations, coalitions, local tribal nations, and grassroots organizers to collaborate and assist them in their efforts to oppose Escalade. The Trust gladly accepted their invitation. 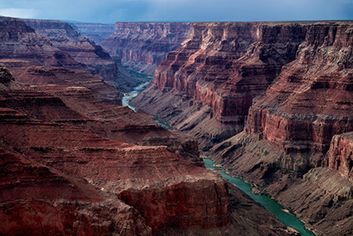 The Hopi Tribe signs a resolution opposing the Grand Canyon Escalade. 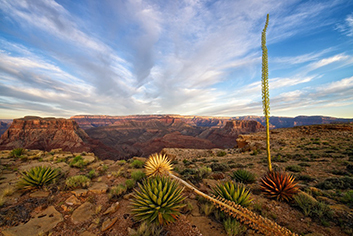 The entire Grand Canyon is culturally significant to the Hopi people, and the confluence area is especially sacred ground. With a unanimous vote, the Hopi Tribal Council agreed to formally oppose Escalade. 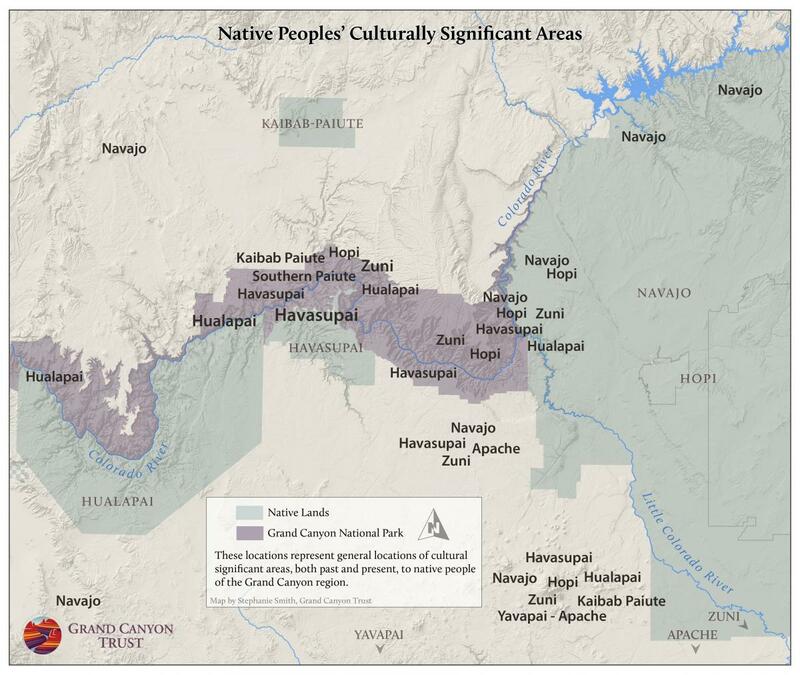 According to the resolution, the proposed development would “forever adversely impact Hopi sacred places to which Hopis have aboriginal title and use.” The resolution also authorizes the tribe to pursue legal actions to prevent the development. 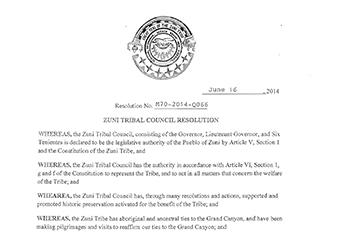 The Zuni Tribal Council signs a resolution opposing Grand Canyon Escalade. 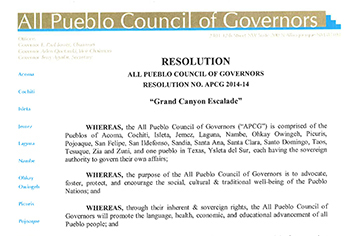 The All Pueblo Council of Governors signs a resolution opposing Grand Canyon Escalade. The All Pueblo Council of Governors (representing the pueblos of Acoma, Cochiti, Isleta, Jemez, Laguna, Nambe Ohkay Owingeh, Picuris, Pojoaque, San Felipe, San Ildefonso, Sandia, Santa Ana, Santa Clara, Santo Domingo, Taos, Tesuque, Zia and Zuni, and Ysleta del Sur) passed a resolution against Escalade after several pueblos requested their support to protect the Grand Canyon. 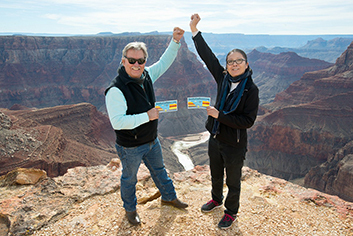 "The All Pueblo Council of Governors hereby supports the Hopi Tribe, and Zuni, Acoma and Laguna Pueblos in all avenues, including legal actions and sponsorship of legislation at the state and national levels, to oppose and prevent the 'Grand Canyon Escalade' and all other exploitive commercial development of the Grand Canyon." President Russell Begaye unknowingly signs an agreement to advance Escalade. During incoming President Russell Begay's inauguration ceremony, former president Ben Shelly presented Begaye with a written agreement to sign in front of hundreds of witnesses. The next morning's headlines proclaimed: "Begaye Backs Aerial Tram: The new Navajo president agrees to advance the Escalade project in the Grand Canyon." However, neither the new president nor his staff had read the document and were "blindsided" by Escalade's exiting advocates. Save the Confluence families and allies immediately asked the new administration to reject the agreement and to issue a definitive statement against Escalade. 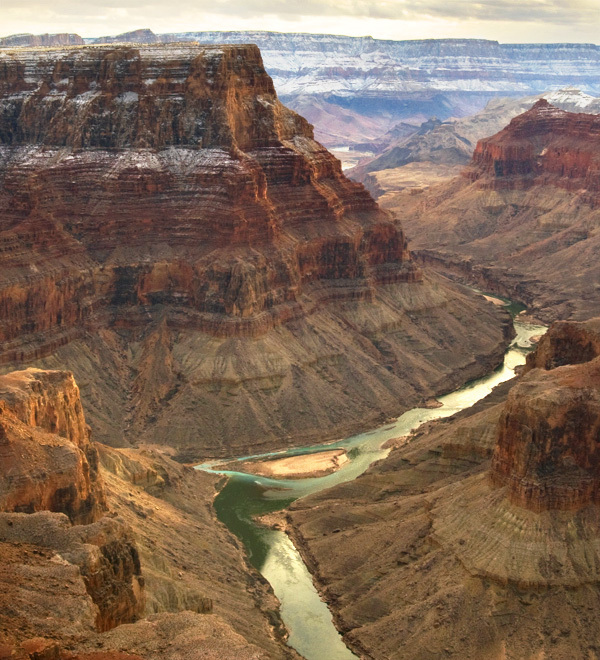 President Russell Begaye formally asserts his opposition to the Grand Canyon Escalade proposal. After the inauguration fiasco, the next day's headlines read: Navajo President Takes a firm stand against Grand Canyon Tram. "The agreement signed yesterday during the Inauguration between President Russell Begaye and outgoing Ben Shelly was historic and a symbolic gesture of Ahiɫ na' anish, a smooth transition and an agreement in principle as a new administration takes office. The listing of projects on the agreement are those of the Shelly-Jim administration. The Begaye-Nez administration will vet and evaluate each project and determine whether the project will be in the best interest of the Navajo Nation and our people. A bill drops before the Navajo Nation Council seeking $65 million in Navajo Nation funding for Escalade. For years, the developers had been threatening to introduce legislation that would push the Escalade project forward. In August 2016, they finally convinced Fort Defiance Councilman Benjamin Bennett to sponsor the bill. 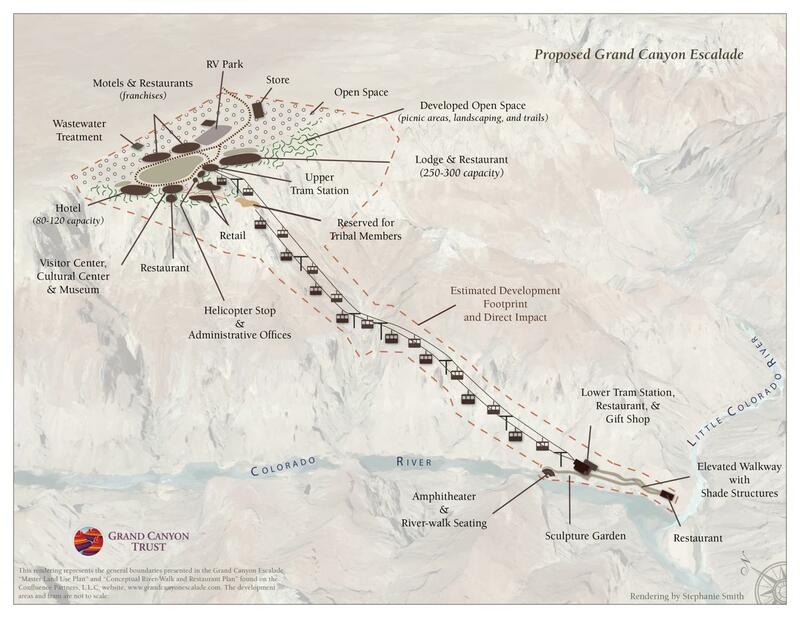 Bennett's bill, if approved, would pave the way for building a resort complex on the eastern rim of the Grand Canyon, including a tramway to the bottom at the confluence, where the Colorado and Little Colorado Rivers meet. According to Navajo Nation's legislative process, the bill must move through four committees before coming to a final vote, where a two-thirds majority is required for final passage. The Law and Order Committee unanimously turns down Escalade bill. The first of four committees voted against the Escalade bill in a 5-0 vote, citing the following concerns: failure of the developers to get consenting signatures from local grazing permit holders, the $65 million investment required by the Navajo Nation Tribe, and the development's impact on sustaining earth-based Navajo faith. 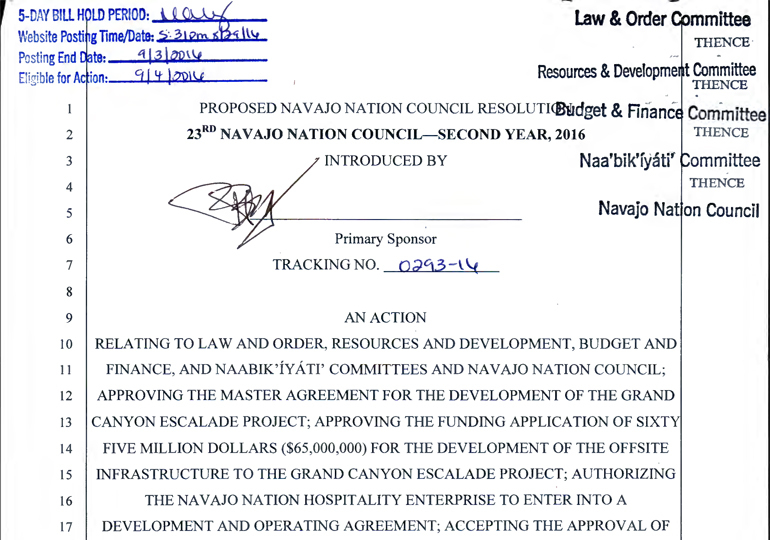 The Navajo Nation Council's Budget and Finance Committee rejects Escalade bill. The Budget and Finance Committee voted against Escalade, with 3 opposed and 1 in favor of the bill. Those opposed took issue with the lack of community involvement, opposition from local land users, and unanswered questions the developers have failed to address. The final Naabik’iyati’ Committee overwhelmingly opposes Escalade bill. The final committee to debate the Escalade bill voted against it in a 14-2 vote. 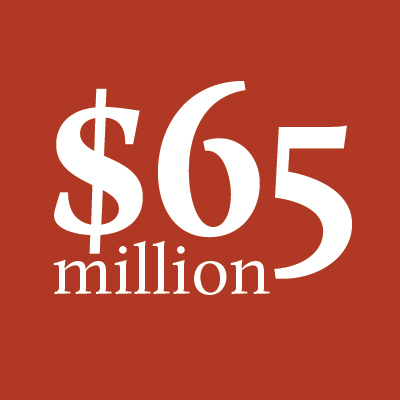 Committee members said the required $65 million investment from Navajo Nation could be better spent on improvements to communities, like roads, scholarships, and other infrastructure projects. The bill now moves to the full council for deliberation and a final vote. The Escalade legislation is missing from Navajo Nation Council’s summer agenda. Without the votes to pass the Escalade legislation, the bill’s sponsor, Councilman Ben Bennett, put the legislation on hold, delaying the final vote. The next opportunity for the council to deliberate the bill is in October, during the fall council session. 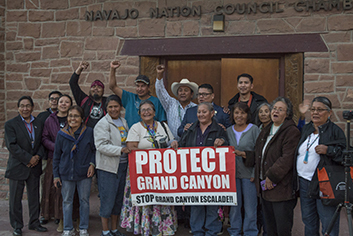 Navajo Nation Council slams the door on Grand Canyon Escalade. More than a year after council delegate Ben Bennett introduced the Escalade bill, the full Navajo Council took up the issue in a special session on Halloween. After several hours of debate, the Navajo Nation Council slammed the door on the Grand Canyon Escalade by a vote of 16–2. The decisive vote was the culmination of seven gut-wrenching years of opposition by Save the Confluence families and Navajo citizens, who joined Hopi, Zuni, and Acoma leaders on Tuesday, October 31, to witness the dramatic decision to kill the Escalade bill. 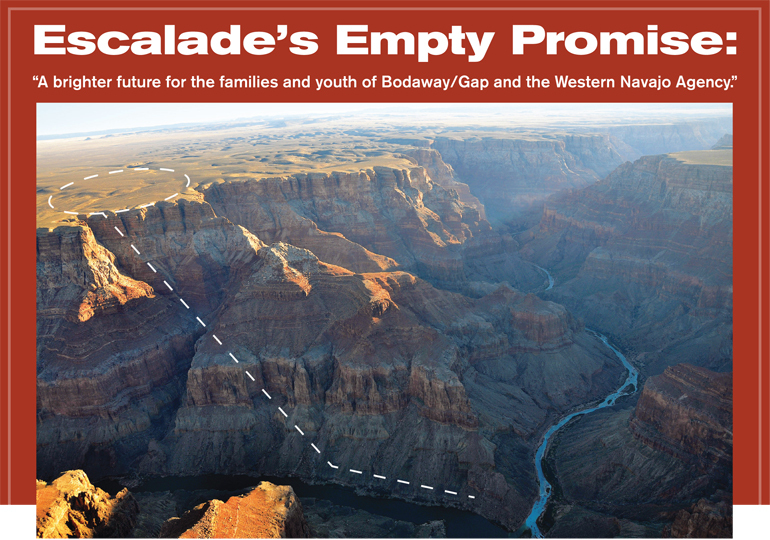 Bodaway/Gap chapter rescinds resolution that greenlighted Grand Canyon Escalade. But on February 24, 2018, and by a vote of 55-0, the Bodaway/Gap chapter of the Navajo Nation rescinded the 2012 resolution that greenlighted the hotly contested tramway and resort proposal. The Trust supports Save the Confluence families and joins them in their fight to stop bad development. Support for Escalade wavered, and as politics in the nation shifted, the developers struggled to find a tribal council person to sponsor their legislation. When they finally did, and the bill worked its way through the Navajo Nation legislative process, the council slammed the door on Escalade by a vote of 16-2. Land the development would occupy, trampling the rights of Navajo grazing permit holders in the area. Acres of Navajo lands along access roads developer Lamar Whitmer would close to competing businesses. Tourists per day the tramway could shuttle to the sacred confluence at bottom of the Grand Canyon. 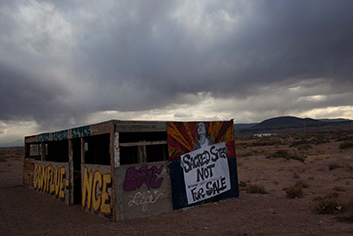 Initial offsite infrastructure costs to the Navajo Nation, also financially responsible for maintenance. 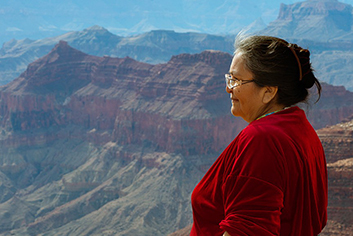 Many Native American tribes have sacred cultural ties to the Grand Canyon. For some, the confluence is where life began — their place of origin and emergence.